Companies aggressively competing in for revenue and market share sometimes find themselves responding to competitor’s attacks. Sometimes this is created inadvertently, but often it is included in the sales process. The impact can range from mildly annoying to highly damaging. Since overt FUD campaigns tend to lead to lawsuits, most FUD campaigns tend to be subtle and covert. Senior marketing executives should understand how all their functions can be involved. Leading CIOs know that demand management is key to success in the role. CIOs, Enterprise Architects and Senior Vendor Marketers need to discover where business is headed next and what will be required of them. To shed some light on that, in this session we will share some of the fascinating results obtained from Gartner’s most recent global CEO and senior business executive survey. Cybersecurity threats continue to morph and have severe impact. Trends like use of the cloud, consumerization and mobility are changing the way IT is delivered and are both enabling new threats and breaking old security processes. •What social, business and technology trends are leading to increased threat to businesses? •What security technologies and processes will provide the highest return on investment over the next 5 years? •How can businesses balance protecting customer data with increasing revenue? Cool Vendors is Gartner’s evaluation of the hottest little-known companies in technology from around the world. In 2011, Cool Vendors are as plentiful as ever, and service provision is a key theme along with consumer devices and their use. As these vendors go forth, they will affect markets cresting over the horizon prove that innovation is alive and well and that the savvy investor, vendor, or IT manager will do well to remain on the lookout for good buys, great technology, and partnerships that can shape the future. Join MVP and Gartner Fellow Daryl Plummer for a look at our cool vendors from 2011 and how they will affect markets cresting over the horizon. •What is a Cool Vendor and how are they Selected? •How are Cool Vendors affecting modern IT Strategies? Manufacturers and retailers are facing an increasingly complex global environment, with growth opportunities coming from new and changing markets. Managing this growth and complexity while continuing to manage risk, reduce costs and shorten lead times is a top priority for Supply Chain leaders. In this session we will look at some strategies to manage risk and complexity, including maturity models to help you identify your capabilities and the initiatives to get to the next level. This presentation addresses the challenges customers have when negotiating with large software vendors; it focuses specifically on Microsoft, Oracle, IBM and SAP and will recommend negotiating strategies and vendor management tactics for each. For many clients these vendors represent substantial investment requirements and potentially huge savings if contracts are negotiated well; but there are substantial downside costs for those who fail to proactively manage the negotiations. This vendor analysis will provide invaluable insight for negotiators, software asset managers and anyone who will be involved in negotiations with these vendors. •What are the trends in buyer supplier dynamics with major software vendors? •What are the leverage points that can be used in negotiations with these vendors? •What are the primary areas of unexpected risks in the contract and the key terms and conditions that should be negotiated? Some say social media and social networking are the greatest inventions since the Web. Others fear the loss of privacy or simply don't care what strangers had for lunch. We'll examine how to develop a social media strategy and explore how social media can best benefit your business. •What is the impact of social media on business today? •How will internal and external social networks help create business value? •What steps should organizations take to create an effective social media strategy? Technology and service providers looking for growth should understand the new opportunities within vertical industries. After years of lackluster and negative growth, some industry-specific buying centers are significantly increasing their spending. This webinar outlines the major growth drivers across eight vertical industries and highlights new market entry strategies for providers looking to expand in vertical industries in selected emerging economies. •What is the outlook for IT Spending across vertical industries through 2013? •Where are the key growth areas within Industries and what’s driving them? •What are the major market entry strategies for verticals in emerging economies? Cloud computing, iPads, 3D TVs – which emerging technologies will live up to their hype, and which will fall by the wayside? The annual Gartner Hype Cycle Special Report provides a detailed look at over 1600 technologies across a broad range of IT topic areas. This session will discuss some of the high fliers in 2010 to 2011, answer some frequently asked questions about interpreting Hype Cycles, and show you how to create your own Hype Cycle for presentations and discussions. •Which technologies will be hitting the “Peak of Inflated Expectations” during 2010 to 2011. •What are the hot topics and trends during the next five years. •How to use the hype cycle in creating your technology portfolio. Each year, Gartner publishes a list of its best and most provocative predictions for the next few years. These predictions will drive actions for enterprises and individuals preparing current and next-generation strategies. This session, based on Gartner predictions for the next five years, explores how the IT industry will evolve and how this will affect businesses and the lives of people. Please join Managing VP and Gartner Fellow Daryl Plummer as he brings order to this difficult landscape. •What are the key trends that will force action by any business? •Which strategies will be risky, and which will drive new opportunities? •How will spending and value differentiate successful businesses from all others in the 21st century? A disruptive technology is one that drives major change in business processes or revenue streams, consumer behavior or spending, or IT industry dynamics. Virtualization, green IT, staff retention, social networks, unified communications, legacy migrations and cloud computing are among such disruptive trends that are reshaping the IT and business landscape. Companies must identify the disruptive technologies that will impact their users and their business and develop plans to address these disruptions. Please join Managing VP Ray Paquet as he interprets industry trends. Google and Microsoft are investing billions of dollars every year, building out data centers to support their cloud offerings, and hoping to be No. 1 in a world where the cloud is central to computing. We'll focus on the differences between their strategies, and who is likely to succeed most at what. Please join VPs and Gartner Fellows Tom Austin and David Mitchell Smith as they discuss the state of the industry. •Where do Microsoft and Google stand today? •What will be the effect on markets as a result of Microsoft/Google competition? •How will enterprise IT decisions be affected by the battles between Microsoft and Google? 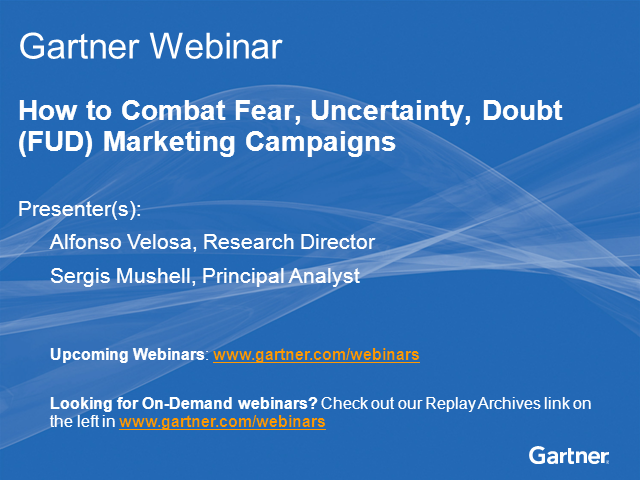 Gartner, Inc. is the world’s leading IT research and advisory company.